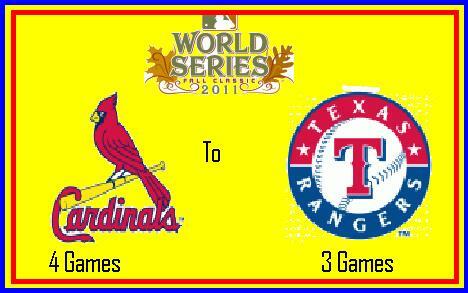 2011 World Series–One of the Best Ever! | Bill Baxter's Colorado Sports Blog. Bill Baxter's Colorado Sports Blog. Colorado Sports–Short and to The Point! Denver Broncos Homecoming–Gary Kubiak Returns as Head Coach. 2011 World Series–One of the Best Ever! Only one team can be crowned World Series Champions every season, but this was a World Series where BOTH TEams were winners! This was one of the best World Series ever where both teams played well. The Texas Rangers didn’t win but they have a lot of reasons to still hold their heads up high! To the St. Louis Cardinals I say WELL DONE. Have a great celebration because you deserve it! Your 2011 MLB Division Champions. Happy Veteran’s Day 2011 ! Bill’s Colorado Sports Blog is Now on Facebook. Brett Farve’s All Time Record Broken–Oct. 19, 2014. Partha Pratim Dutta on Follow Me on Twitter.